Samuel Williamson was a son of William and Annie Williamson. Samuel was born in Killyman, Dungannon, County Tyrone on 1st February 1891. Samuel served with the British Army, with the Royal Regiment of Artillery. Samuel Williamson then emigrated to Australia where he enlisted with the 4th Australian Infantry. Corporal Samuel Williamson was wounded at the Dardanelles at Gallipoli in Turkey. Corporal Samuel Williamson died of disease on 8th May 1917. He was 26 years old. He is buried in Durrington Cemetery, near Andover in Wiltshire, England. Samuel Williamson was a son of William and Annie Williamson. Samuel was born in Killyman, Dungannon, County Tyrone on 1st February 1891. Samuel went to school in Ballynakelly, Coalisland. 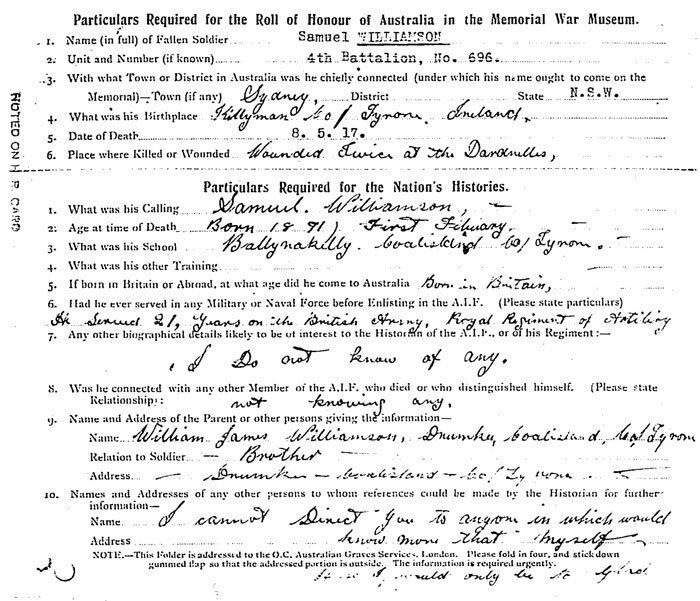 Samuel Williamson enlisted with the 4th Australian Infantry. Corporal Samuel Williamson was had returned to Ballynakelly only a few weeks before he died. He was a member of the Bush Loyal Orange Lodge, No. 163 and spent an evening in Ballynakelly Orange Hall. Mr William James Williamson, Drumkee, Coalisland, has received intimation of the death of his brother, Corporal Samuel Williamson, of the Australian Imperial Forces, who died on 9th May from hear failure at Fargo Military Hospital, Rollestone, Wiltshire. His remains were interred in Durrington cemetery with military honours. 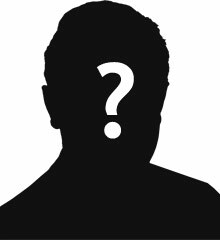 He had served for 21 years in the Army, and took his discharge from Bombay, and emigrated to Australia, where at the outbreak of the war he volunteered, and landed at the Dardanelles with the first Australian Forces, was wounded twice, and afterwards served in France. He was at his home a few weeks ago, and looked remarkably well, and spent a very pleasant night in Ballynakelly Orange Hall, amongst his friends and neighbours, and got a very hearty reception. He was a member of the Bush Loyal Orange Lodge, No. 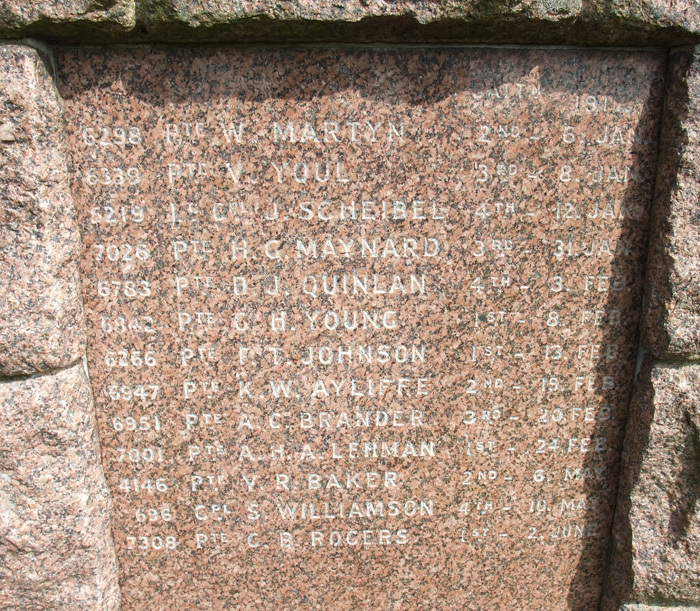 163, the members of which deeply regret the loss of such a gallant soldier and esteemed member. 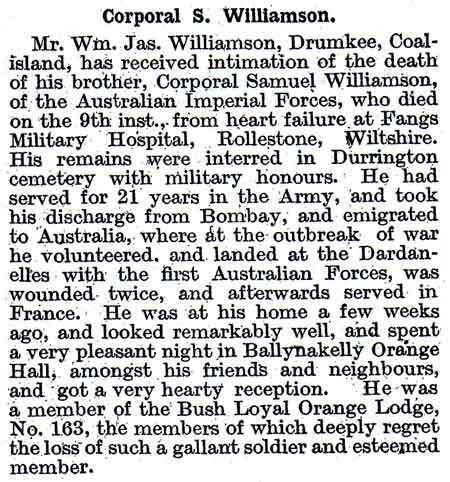 Corporal Samuel Williamson, Australian Infantry, died of heart failure, Ballynakelly, Coalisland. He is buried in Durrington Cemetery, near Andover in Wiltshire, England. Samuel listed his brother in William James Williamson Drumkee, Coalisland Co Tyrone. He also named his next of kin in his attestation documents as M Williamson, Queen's Hotel, Ontario, Canada. 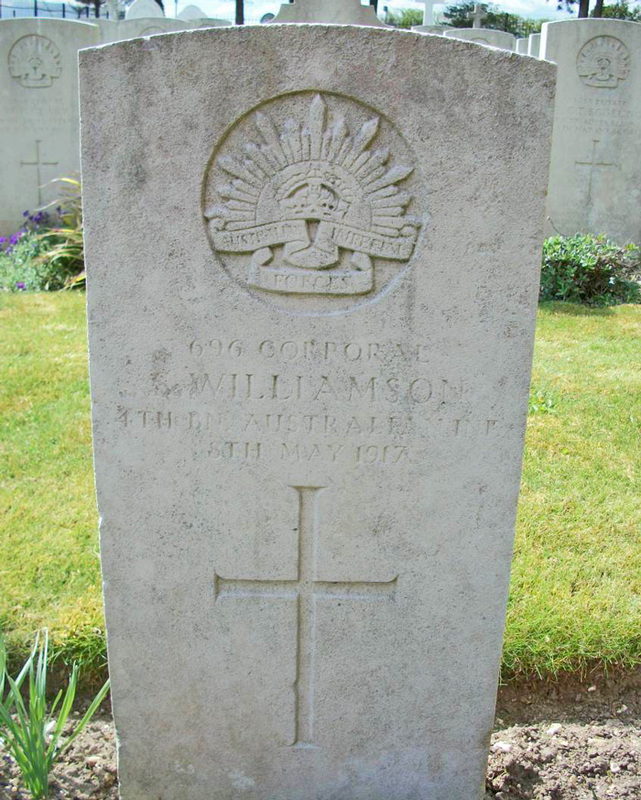 Corporal Samuel Williamson is listed on the Australian War Memorial in Durrington Cemetery. 7 War Graves Photographic Project Photo of Samuel Williamson's headstone can be purchased here.